FROM danger derby to dreamland, the outlook had changed drastically for Alan Pardew by the time Howard Webb brought a crackling Wear-Tyne tussle to a close . 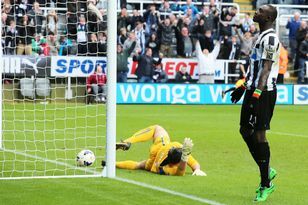 After a tough month, the Newcastle manager certainly needed the fillip of this hard-earned derby win. But the fact that it owed much to his own ingenuity might make it just about the most important victory of his eight rollercoaster months in charge. Pardew resisted that claim in the immediate aftermath of Newcastle’s first win of the campaign, insisting that beating Liverpool and blasting away the rancour in the days after his controversial appointment was more crucial than this victory. But he must have sensed the mood souring on Tyneside over recent weeks, frustration building over a summer recruitment drive that has not so much stalled but come to a grinding halt of late. And he must have been aware of the fact that his own reputation was suffering by association with a regime still treated with cynicism by the majority of Newcastle’s support. One internet wag, pointing to his polished performances in press conferences, even went as far as to dub him Alan PR-dew during another week of transfer bluff and bluster, that had the manager once again making excuses for the inaction of those in the corridors of power at St James’ Park. Those issues became irrelevant by close of play on Saturday – Pardew having posted the most pressing reminder possible of his managerial credentials on a frenetic day of derby battle. From a defensive effort that was resolute to a formation and game plan that was played out to perfection, it was a fine day for the Wimbledon-born boss and his backroom staff. It took some guts to send United out in such an unfamiliar system and for 45 minutes, it appeared as if it would rebound on the Newcastle boss. The struggling Cheick Tiote was deployed just in front of the back four and Joey Barton withdrawn from the right midfield slot which had proved so profitable in recent weeks, and Newcastle just couldn’t find a midfield foothold. Yohan Cabaye improved but will need time while Jonas Gutierrez was so deep that he was almost supplementing emergency full-back Ryan Taylor – the man who was to eventually strike the killer black and white blow. But Pardew, who had spoken of the need for cool heads in the build up, felt the formation was the best way to draw the venom out of quick-starting Sunderland. It was a prescient view – not half helped by the superlative form of his two centre-backs. In two tough games, Fabricio Coloccini and Steven Taylor are yet to put a foot wrong and they were simply superb at the Stadium of Light. Pardew was a midfielder of some repute in his day but as a coach, has worked hard on the defensive aspect of United’s play, which has been evident in the first two games. For opposite number Steve Bruce this is becoming a bit of an unwanted habit – and it piles the pressure on him after an encouraging engagement at Anfield for his new-look side last weekend. Much was made of the fact he had brought in ten new arrivals imbued with experience over the summer, but once again his side came up short when faced with the challenge of toppling black and white supremacy. They actually played well in the first half, dominating in terms of possession and purpose for a good 45 minutes. But when they failed to find a breakthrough and ran out of momentum in the second period, where was Bruce’s Plan B? It appeared to be hitting the channels and using his wide men to sweep crosses to a pair of big strikers summoned from the bench. But most in the sold-out crowd could see the futility of such an approach. Steven Taylor and Coloccini were so imperious that there was no way back once Ryan Taylor’s free-kick had sailed over Simon Mignolet. And when Sunderland needed craft there was precious little of it in his new-look Black Cats squad. No wonder Bruce was so desperate to sign Charles N’Zogbia who would have made a huge difference to a midfield that looked more and more pedestrian as the contest wore on. All, of course, is not lost. One game is not enough to make a judgement on Sunderland’s season. But defeat in this game does reduce the margin of error for a boss who seemed to have just about clawed back all of his credit following last October’s 5-1 Halloween horror show at St James’. He cannot afford an early exit from the Carling Cup at Brighton tomorrow night and there will have to be an urgency about Sunderland’s work when they travel to Swansea on Saturday too. In truth, this was not a contest of enduring quality from either team. These games are rarely classics – but there is a feeling that both sides are in locked in something a transitional phase. But it is one that Newcastle seem to be making quicker progress through. STEVE Bruce is determined to keep his head while others are losing theirs following derby defeat. SUNDERLAND go into the earliest-ever Tyne-Wear derby buoyed by a positive pre-season, Newcastle United on the back of a warm-up which has lurched from one crisis to the next.